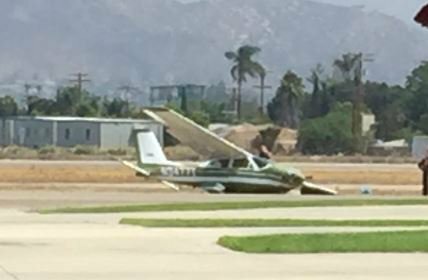 On July 28, 2018, about 1000 Pacific daylight time, a Cessna 177 airplane, N3477T, experienced a loss of engine power during takeoff at the Gillespie Field Airport (SEE), San Diego/El Cajon, California. The private pilot and passenger were not injured. The airplane was substantially damaged. The airplane was registered to and operated by the pilot under the provisions of Title 14 Code of Federal Regulations Part 91, as a personal flight. Visual meteorological conditions prevailed and no flight plan was filed for the cross country flight. The flight was originating at the time and destined for Catalina Airport (AVX) Avalon, California. According to the pilot, shortly after takeoff, the engine experienced a loss of power and the airplane settled back towards the runway. Subsequently, the left wing struck the runway and sustained substantial damage during the forced landing. EL CAJON, Calif. (KGTV) — Two people were injured after an aircraft crashed at Gillespie Field Saturday. The hard landing was reported just before 11 a.m. Heartland Fire Department confirmed at least two people were injured in the crash. The extent of damage to the aircraft was not immediately clear. Airfield officials have yet to release what led to the crash.